Go to the Channel Store on your Roku player. Press the asterisk symbol "*" on your Roku remote and search for "Dove Channel". Go to your Roku Settings. Once you are at settings, go to "System". 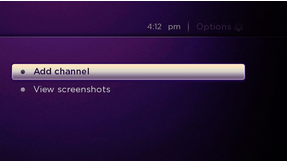 Select "Check Now", even if you think your Roku is up to date. Once the update has processed, repeat the steps above for searching for Dove Channel. Select "Add channel" and confirm the selection when prompted. After you have added the channel, go ahead and open it. If you have not already registered for a Dove Channel account, click the "Join Now" button to enter the registration process. Once you have registered, you can also upgrade your membership in order to view all of our titles. if you already have a Dove Channel account, select "Sign In" and enter your username and password. You are now ready to watch Dove Channel on your Roku!